And then, the big question: “Who wants to touch real brains?” The room popped with a chorus of “Me!” as hands waved in the air and the third- and fifth-graders exchanged looks of wonder and excitement. Energetic and whimsical, Bimonte-Nelson, bounced in the front of the room as she led the children through warm-up exercises, having them point to their frontal lobe, temporal lobe and occipital lobe, while shouting out the names of each lobe. For the next several hours, children rotated among learning stations, designed by ASU students who were there to demonstrate science and answer questions. At one of the stations, children put on gloves and held or touched real sheep brains. “The brain is so cool,” one child exclaimed. Two third-graders from Imagine Schools at Camelback, Carlos and Santos, could hardly wait to describe their experiences at the fair. “We’re learning about illusions and how our eyes get tired, and we touched goop.” Santos said excitedly. Not missing a beat, Carlos added “This is our second time here and I want to come again next year. The slimy brain is the best!” he said, before rushing off to another station. At the Microscope Imagination Station, shrieks of excitement and awe erupted as a group of fifth-graders from Kyrene de la Sierra Elementary School had the opportunity to touch a very long, live carpet python. Some 650 kindergarteners through fifth-graders from Creighton Schools, Imagine Schools at Camelback, Kyrene de la Sierra Elementary School, Pardes Jewish Day School, John F. Kennedy Elementary, and V.H. Lassen School participated in this year’s brain fair at ASU April 4-5. In addition to the more than 100 student and faculty volunteers from psychology and the School of Life Sciences, guest scientists from Barrow Neurological Institute of St. Joseph’s Hospital and Medical Center and the University of Arizona College of Medicine were also in attendance to talk science with the children. Sponsors credited for devoting time and resources included ASU School of Life Sciences Undergraduate Research (SOLUR) Program, ASU Psychology Department, Phoenix Children’s Hospital, Dunne Transportation and the Society for Neuroscience. 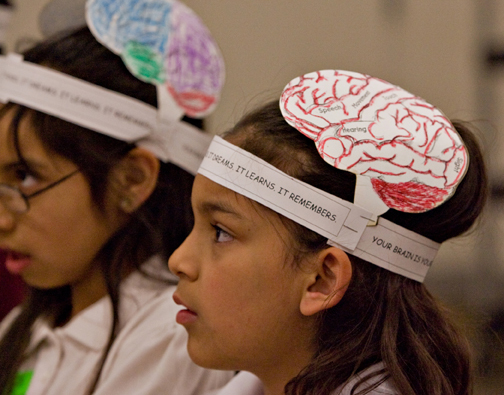 Five years ago, Bimonte-Nelson began a community outreach program during Brain Awareness Week and started visiting local elementary schools to speak about the brain. She and her students have also conducted programs at the Children’s Museum of Phoenix and Arizona Science Center. Her program gained so much popularity from children, teachers and parents alike, that she realized she couldn’t continue to cart microscopes and brain models from classroom to classroom. In a flash of genius, she decided to host a Brain Fair at ASU and bring the children to a university setting. ASU has a chance to host its first regional since 2003. The No. 15 Arizona State women's tennis team's success might have surprised some Pac-10 opponents, with the Sun Devils upsetting California in Tempe and defeating USC in Los Angeles, but the success comes as no surprise to the ASU team themselves. "You have to hand it to them," said head coach Sheila">http://thesundevils.cstv.com/sports/w-tennis/mtt/mcinerney_sheila00.html... McInerney of her players. "I'm really proud of our kids. We had some tough losses but they're really resilient. We're a really good team. For our kids it's really nice to validate that with [great wins]." McInerney is rounding out the 27th season of her coach career at Arizona State, the second-longest tenured coach on staff. The veteran coach is on pace to notch one of the most successful seasons in her run as head coach for the Sun Devils. Following ASU's victory at Washington, the Sun Devils compiled a five-match winning streak. One of the main elements of Arizona State's success is the leadership of veteran upper classman on the court. The Sun Devils have three seniors and a junior in the line-up with Ashlee">http://thesundevils.cstv.com/sports/w-tennis/mtt/brown_ashlee00.html">As... Brown, Micaela">http://thesundevils.cstv.com/sports/w-tennis/mtt/hein_micaela00.html">Mi... Hein, Kelcy">http://thesundevils.cstv.com/sports/w-tennis/mtt/mckenna_kelcy00.html">K... McKennaand Michelle">http://thesundevils.cstv.com/sports/w-tennis/mtt/brycki_michelle00.html"... Brycki. With her stellar tournament play this fall, McKenna has been the go-to player for the top spot in the ASU line-up. McKenna, ranked 19th in the nation by ITA, won the Cal Nike Invitational and became the first Sun Devil to win the ASU Thunderbird Invitational this fall all while completing a rigorous student-teaching schedule. With McKenna, Hein makes up the other half of Arizona State's top doubles team. The senior duo, ranked 18th in the most recent ITA doubles rankings, has competed as doubles partners for the majority of the past three seasons. Making an immediate impact in her freshman season, Jacqueline">http://thesundevils.cstv.com/sports/w-tennis/mtt/cako_jacqueline00.html"... Cako had an 18-match singles winning streak before dropping her first match of the dual season in late March. Cako, No. 16 according to ITA, went into three sets with Washington's No. 23 Venise Chan before snapping her run against the Husky.